In the last 15 years, over 100,000 military members who were immigrants are now United States citizens. Immigrants serving in the United States military has deep historical roots. Non-citizens have fought in and with the U. S. Armed forces since the Revolutionary War. According to One America, nationally, each year around 8,000 non-citizens enlist in the military. Naturalization through military service is a legitimate method to increasing recruitment as well as giving immigrants an opportunity to become citizens. MIlitary service for citizens as well as immigrants with Green Cards is a voluntary process. Each branch of the services has different requirements for enlistment, but there are some standard requirements that all the branches have. Among these requirements is that only individuals who are U.S. citizens can become commissioned officers or require special security clearances (Intelligence, Nuclear Power, Special Operations) in the United States military. Those who are considered US citizens also include citizens of Puerto Rico, the Northern Marianas Islands, the Federated States of Micronesia, Guam, the U.S. Virgin Islands, American Samoa, and the Republic of the Marshall Islands. Non-citizens are eligible to enlist in the military but can not be commissioned. In order for an immigrant to join the United States military, they must first go through the immigration process of the USCIS (previously known as the INS - Immigration and Naturalization Services) and then and then begin the enlisting process. Another requirement is that the Green Card and/or visa of the immigrant desiring to join the military must be valid for the entire period of their enlistment. Undocumented immigrants may not enlist in the U.S. military. On most military bases there is a USCIS representative to discuss and assist with the administrative process of applying for citizenship. The Dream Act (Development, Relief and Education for Alien Minors) was a bill that has stalled in Congress with a specific provision for military service in that dreamers could either go to college or join the military in order to benefit from the Dream Act. 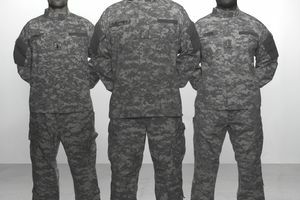 Although immigrants are eligible for deferred action if they have been honorably discharged from the military, undocumented immigrants are not eligible to join up, meaning the policy would only apply if they had already served. Individuals who enlist in the military and are non-citizens are limited to one service term. If non-citizens become U.S. citizens then they are permitted to reenlist. For an immigrant who joined the US. military, once they are in active duty status in the military, the process of going from a non-citizen to U.S. citizen can be expedited. Military services and the US Citizenship and Immigration Services have worked together to streamline the citizenship application process for service members. In July 2002, President Bush issued an executive order that made non-citizen members of the armed forces eligible for expedited US citizenship. Revisions in the US citizenship law in 2004 have allowed USCIS to conduct naturalization interviews and ceremonies for foreign-born US armed forces members serving at military bases abroad. According to USCIS data from April 2008, more than 5,050 foreign-born service members have become citizens during overseas military naturalization ceremonies while on active duty in countries such as Iraq, Afghanistan, Kosovo, and Kenya, as well as in the Pacific aboard the USS Kitty Hawk. Since September 2001, USCIS has naturalized more than 100,000 foreign-born members of the armed forces and granted posthumous citizenship to 111 service members. According to February 2012 data from the Department of Defense, more than 24,000 immigrants ( non citizens and naturalized citizens) were serving on active duty in the U.S. Armed Forces. This represents approximately 3% of all active-duty personnel. Nationally, each year around 8,000 non-citizens enlist in the military. The top two countries of origin for foreign-born military personnel in the U.S. are the Philippines and Mexico, with nearly 11 percent of those serving in the armed forces being of Hispanic origin. As of 2016, over 500,000 foreign born veterans resided in the United States. Foreign veterans make up approximately 3 percent of the total veteran population. The military benefits greatly from the service of its foreign-born. Non-citizen recruits offer greater racial, ethnic, linguistic, and cultural diversity than citizen recruits. This diversity is particularly valuable given the military's increasingly global agenda. Additionally, statistics show that: Asian/Pacific Islander and Hispanic non-citizens who have served for at least 3 months are nearly 10 percent less likely to leave the service than white citizens. Non-citizens who have served for at least 36 months are 9 to 20 percent less likely to leave the service than white citizens.